BRMM members showing off great technique for the Sousamid at Family Weekend 2015. 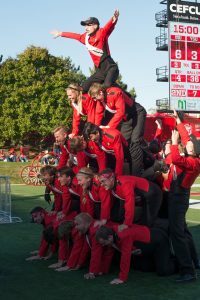 Two major programs stand out during the fall at Illinois State University, football and the Big Red Marching Machine (BRMM). Redbird fans get the best of both when they visit Hancock Stadium, and also get to witness a special tradition courtesy of members of the BRMM. What exactly is it? The Sousamid! For those that are not able to witness this fun performance, here is a bit of history to start. The first Sousamid is thought to have been formed sometime in the 1980s according to Dr. Andy Rummel ’97, M.M. ’99, associate professor for the School of Music and former BRMM member. The Sousamid is a 5-tier human pyramid made up of BRMM’s sousaphone section. “Strategy is often employed to ensure the structural integrity of the pyramid, however, in my experience throughout the decades, the fun was seeing how many levels we could build,” said Rummel. “I don’t think that we were ever very successful! These days, with 20 sousaphones in the section, the pyramid has become quite a huge feat! A perfect Sousamid done at Homecoming 2017. A student within the sousaphone section become the visual leader for the group and helps coordinate the Sousamid during the third quarter of home football games. Fans can keep an eye on the BRMM’s corner on the field to see the Sousamid come to life. The Sousamid is a great example of a valued tradition at Illinois State. It has brought strong connections, loyalty, and history to the Big Red Marching Machine members from the past, present and will continue into the future.